I've not been feeling my best lately so progress has been spotty. We'll see how it goes over this weekend and if I'm feeling up to finishing more stuff. People have asked what size the O-Rings are on the new tools. 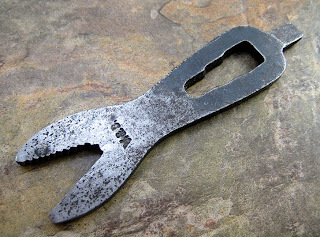 They are #109 on the O Ring size chart and measure 3/32" wall, ID 5/16", OD 1/2". I'm using the standard black Buna-N type but almost any of the materials available would work. 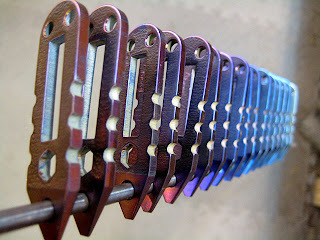 These were actually electrically anodized on an experimental basis. 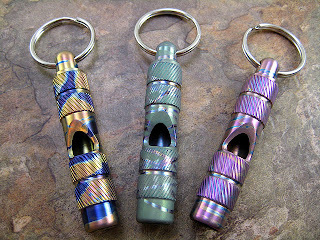 I've got a few ti whistles up on the site today. I have plain satin, electric blue and some wild heat colored ones. The heat coloring is impossible to control so the effect ends up varying a great deal from piece to piece. They look cool though and the layer of oxide on the surface of the metal is pretty tough. Site is back up after being down for several hours yesterday afternoon. I'm also receiving my email again although it is still a little pokey. I thought I'd do a few of these little guys in titanium. Overall length is just about 2.5 inches. I have applied an orange peel texture to the metal and then heat colored these for a more durable finish. 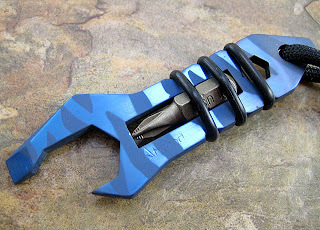 The surface is much harder than conventional electrical anodizing and it resists fingerprints very well. The trade off is that it is impossible to achieve an absolutely uniform color over the whole piece, but that just adds to the charm in my opinion and makes each piece unique. 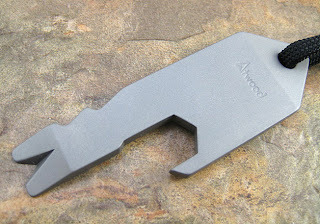 Plain satin finish with orange peel will also be available. As you can see the thing is pretty crude but the idea is there. I should note that I had the idea of the captive object in the skeletonized handle even before seeing this piece with the wrench cut outs. Anyway, the piece is heavy duty, made of about 5/32" thick steel, obviously stamped out then the end had a very rudimentary screwdriver tip forged out from it. I estimate that is certainly early 20th century vintage if not earlier. Well I'll be darned! A customer emailed me with information from the US Patent database and this tool or one very similar to it turns out to have been patented in 1898 by Vaughn and Bushnell and sure enough it bears the stamp V&B right on it. So it is likely right around 100 years old. Awesome!